For other uses, see Holland Park (disambiguation). Holland Park is a district and a public park in the Royal Borough of Kensington and Chelsea, in west London. Holland Park has a reputation as an affluent and fashionable area, known for attractive large Victorian townhouses, and high-class shopping and restaurants. There are many popular shopping destinations located around Holland Park such as High Street Kensington, Notting Hill, Holland Park Avenue, Royal Crescent, Portobello Market, Westbourne Grove, Clarendon Cross and Ledbury Road. Though there are no official boundaries, they are roughly Kensington High Street to the south, Holland Road to the west, Holland Park Avenue to the north and Kensington Church Street to the east. Holland Park Avenue is at the boundaries of the four census wards of Norland, Holland, Pembridge and Campden. Holland Park is about 22 hectares (54 acres) in area. The northern half of the park is semi-wild woodland, the central section around the ruins of Holland House is more formal with several garden areas, and the southernmost section is used for sport. Holland House is now a fragmentary ruin, having been devastated by incendiary bombing during the Second World War in 1940, but the ruins and the grounds were bought by London County Council in 1952 from the last private owner, the 6th Earl of Ilchester. Today the remains of the house form a backdrop for the open air Holland Park Theatre, which is the home of Opera Holland Park. The green-roofed Commonwealth Institute lies to the south. The park contains a cafe as well as the Belvedere Restaurant that is attached to the orangery, a giant chess set, a cricket pitch, tennis courts, two Japanese gardens - the Kyoto Garden (1991) and Fukushima Memorial Garden (2012), a youth hostel, a children's playground, squirrels and peacocks. In 2010, the park set aside a section for pigs whose job was to reclaim the area from nettles etc., in order to create another meadow area for wild flowers and fauna. Cattle were used subsequently to similar effect. The Holland Park Ecology Centre (2013), operated by the borough's Ecology Service, offers environmental education programs including nature walks, talks, programs for schools and outdoor activity programs for children. 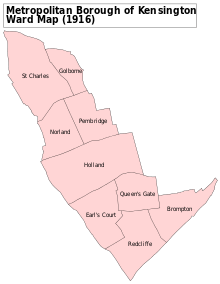 A map showing the Holland ward of Kensington Metropolitan Borough as it appeared in 1916. The district was rural until the 19th century. Most of it was formerly the grounds of a Jacobean mansion called Holland House. In the later decades of that century the owners of the house sold off the more outlying parts of its grounds for residential development, and the district which evolved took its name from the house. It also included some small areas around the fringes which had never been part of the grounds of Holland House, notably the Phillimore Estate (there are at least four roads with the word Phillimore in their name) and the Campden Hill Square area. In the late 19th century a number of notable artists (including Frederic Leighton, P.R.A. and Val Prinsep) and art collectors lived in the area. The group were collectively known as "The Holland Park Circle". Holland Park was for the most part very comfortably upper middle class when originally developed and in recent decades has gone further upmarket. The stucco fronted crescent is painted white, in the style of the many Nash terraces which can be elsewhere in London's smarter residential areas. Today many of these four storey houses have been converted to apartments, a few remain as private houses. The Royal crescent is listed Grade II. Aubrey House is situated to the North-East of the park. Holland Park is now one of the most expensive residential districts in London or anywhere in the world, with large houses occasionally listed for sale at over £10 million. A number of countries maintain their embassies here. Pete Townshend's song "How Can You Do It Alone" includes the narrator's reference to a flasher walking up Holland Park Road. The song is included on The Who's 1981 album Face Dances. The BBC sitcom As Time Goes By is primarily set in Holland Park. Edina Monsoon's house in Absolutely Fabulous is in Holland Park, and she is eager to disavow assumptions that it is located in Shepherds Bush. Dutch band Cloudmachine's song Time Passes For Everyone describes Holland Park and its visitors on an autumn day. In Kate Atkinson's 2013 novel Life After Life, lead character Ursula Todd's wealthy and free spirited Aunt Izzy lives in Holland Park. Todd and partner Derek witness the 27 September 1940 burning of Holland House while raiding her Aunt's wine cellar. ↑ "Parks & Gardens UK Holland Park, Kensington, England". web page. Copyright Parks and Gardens Data Services Ltd. 2012. Retrieved 28 January 2013. ↑ "Making mates on giant chessboard in Holland Park | News". Thisislondon.co.uk. 1 November 2010. Retrieved 25 September 2011. ↑ Development of the Norland Estate. 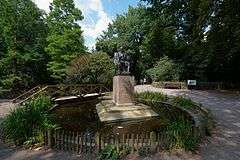 Wikimedia Commons has media related to Holland Park. Map of Holland Park - the word "Kensington" is printed across the middle of Holland Park. 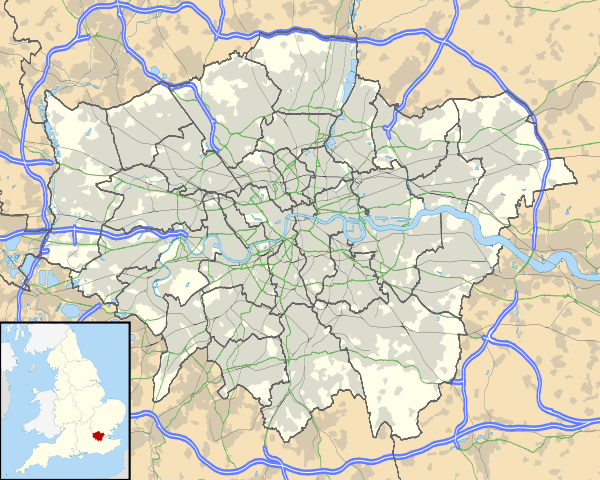 Kensington is a large district and Holland Park is a subsection of it. The heart of London is off the map to the right.